Ahhh…Shangri-La, the mystical paradise we all dream about. Ahhh…Shangri-La, the mystical paradise we all dream about. Once again, this fictional utopia is the center of a thrilling Strategy/Sim game that will have you collecting supplies and repairing roads at superhuman speed. That’s right, even those of you who struggle to change a flat tire in the real world. You play the role of the lovely Catherine who is making her way to visit the Princess of Shangri-La to celebrate the Flower Holiday. When you arrive, all the blossoms and trees are gone. Instead, Catherine is surrounded by a frost and ice. The evil wizard Snow Fox cast a terrible spell on the land, stripping it from all of its beauty and harmony. Only Catherine, together with the Princess, can break the wizard’s spell and bring back the splendor of Shangri-La in Hidden World. As Catherine, you have 45 challenging levels to pass. 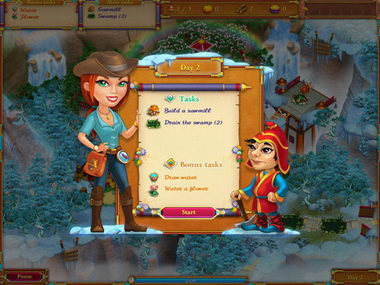 You will have to complete a variety of tasks like gathering food, gold and supplies, building homes, fixing roads and restructuring monuments. 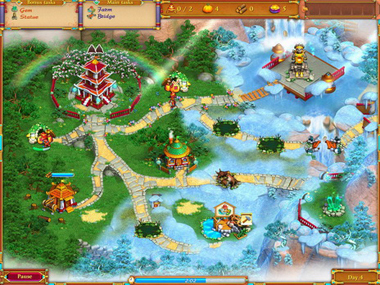 You will be able to use power-ups in this Strategy/Sim game game to ward off the wizard and his followers and aid the citizens of Shangri-La to thaw out their land and return to their happy, harmonious lifestyle. The majority of the levels in Hidden World. will challenge you with 2 main tasks that you must achieve in order to move on. There are also bonus tasks that will reward you with magic lamps that you can use to melt different parts of the castle. Beware of wizard clones, which will appear every now and again to try and freeze your structures and supplies. To stop them, click on them several times and they’ll halt in their tracks. Hidden World definitely ranks high on the cuteness scale. The story itself is adorable, the princess and the prince are sweet to look at and so are the rest of the graphics. If you are not keen on voice overs, you’ll love the fact that this Strategy/Sim game game doesn’t have any, giving it a faster, smoother pace. 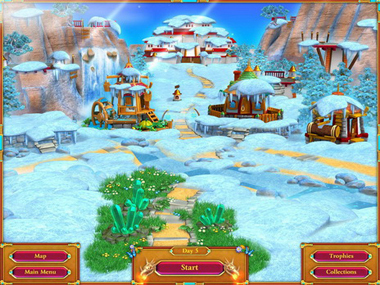 When you get to the final levels of Hidden World, you’ll notice that the game play gets much more difficult. You’ll find yourself surrounded by at least 2 or 3 evil wizard clones or magicians shooting you with ice balls and freezing your supplies. Our tip is to try and use your supplies as fast as you can before they get zapped, but keep a few for later. If you eliminate a wizard, he’ll disappear and your supplies will be doubled. Hidden World. 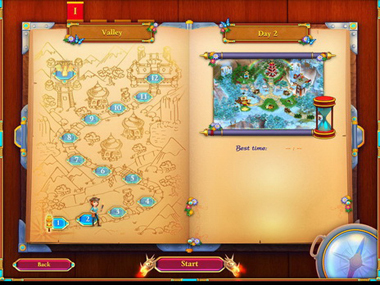 is a marvelous Strategy/Sim game game that is appropriate for all ages, so you can even play it as a family. So recruit your kids today to help save the people of Shangri-La before their land freezes over for eternity! Download this FULL Version PC Game with No Time Limits for FREE! I loved that game, but the last level, I froze at the very end, 5 different times, even downloaded it twice and played thru whole game again. I will comment after I have played for a while. I have no opinion now except where did this come from? I downloaded a RMVB player recently. For some reason I get the prompt to visit this site ever since, whenever I switch on my computer. I cannot close the prompt and force to visit here everytime. I do find it annoying and very inconsiderate of the programmer/marketing. Could you tell me how to get rid of this annoying prompt? I accidently uninstalled Free Game Ride. How do I install it again? downloaded last evening.was 7/10 gets a tad repeatitional by level 10,pity. i have day 34 of this game at least 10 times and it has crashed every time, usually about the time i get to the wizard portal to destroy it. what’s wrong? the website said my computer was system ready to play this game. any fixes for it? This sounds like a great game to play. Is it out yet? Where can I get it? game freezes on every level. Now it freezes just before I finish a level and I have to start it again. What gives????? i tryed to finish the game and it kept kicking me out. so i had to delete the game. i loved that game. i wish that i could play it to its fullity. I HAVE TROUBLE ON THE LEVEL 22-24.. THE SCREEN GOES BLACK .. AND YOU LOSE ALL YOU ACCOMPLISHED … LOVE THE GAME JUST A FEW PROBLEMS. This is a great game!! This one is a brilliant game!!! i don’t know how to do this game? I love you your games! Not facebook fan, but still have something to say? © 2019 FreeRide Games Blog. All Rights Reserved.